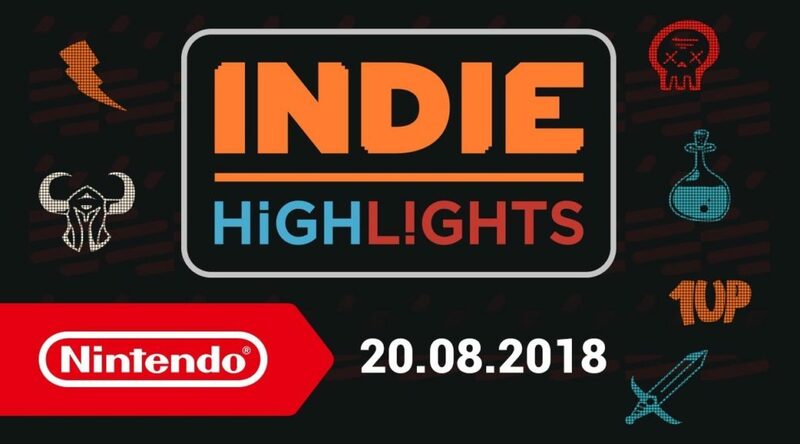 Earlier this morning, Nintendo of Europe released a video called Indie Highlights, showcasing upcoming indie games for Nintendo Switch in 2018 and beyond. If you’ve missed watching the Indie Highlights, you can watch the 22 minute long video below. Alternatively, we’ve listed the games that were announced during the highlights right below the video. Morphies Law from Cosmoscope: We shoot to grow! We grow to win! Get ready for massively morphiplayer action in Morphies Law, a unique team-based shooter where your size affects your abilities, but bigger isn’t always better. Play 4-vs-4 online* multiplayer, and up to 8-person local multiplayer**, with offline play versus bots. Create your own weapons and customise your morphie, with motion-controlled aiming as an option. Morphies Law promises an all-new shooting experience when it launches on Nintendo eShop for Nintendo Switch tonight (20th August at 19:00 CEST). Bad North from Raw Fury: The King has fallen at the hands of Viking invaders. You must rise to take his place and lead the defence of your homeland in this real-time tactics roguelite that will challenge you to pick your battles and plan your strategy carefully. With a charming visual style and gameplay that is accessible to newcomers but offers plenty of tactical depth, Bad North is available now as a timed exclusive on Nintendo Switch. The Viking invasion is here! Will you resist? Prison Architect: Nintendo Switch Edition from Double Eleven/Introversion Software: The BAFTA award-winning prison construction and management game is available to download now on Nintendo Switch. Look after your inmates by building a secure lockup, taking care of their needs, keeping them safe and healthy, and helping rehabilitate them into productive members of society. But be careful, inmates are people; treat them poorly and you’ll find yourself with a riot on your hands. Prison Architect: Nintendo Switch Edition is a premium edition which includes two popular expansions: All Day And A Night and Psych Ward, letting you up the challenge with new wardens and maps, as well as a new security class – the criminally insane. The Escape Mode DLC, which flips the script and puts the player in the shoes of an inmate looking to break out, will be tunnelling its way onto Nintendo eShop later this summer. The Gardens Between from The Voxel Agents: In this surreal and original adventure puzzle game, the aim is to guide two best friends through a series of mysterious garden islands. The twist is that you don’t control the characters – you control time itself! Manipulate cause and effect to solve brain-teasing conundrums and watch a dream-like narrative unfold, when The Gardens Between lands on Nintendo Switch on 20th September. It’s available to pre-order from Nintendo eShop now. Windjammers and Windjammers 2 from Dotemu: The perfect blend of sports, fighting games and 90s style, Windjammers makes a triumphant return on Nintendo Switch, launching on 23rd October. What’s more, an all-new sequel, Windjammers 2, will be slicing into town in 2019. Monster Boy and the Cursed Kingdom from FDG Entertainment: A legendary series returns with a grand new adventure! Monster Boy and the Cursed Kingdom borrows the best elements from the classic Wonder Boy in Monster World series to deliver a fresh, modern platforming adventure filled with shape-shifting gameplay, memorable music and stunning hand-drawn animation. Unleash your inner monster anytime, anywhere when the game launches for Nintendo Switch on 6th November. Moonlighter from 11bit studios and Digital Sun: Play the part of an adventurous shopkeeper with dreams of becoming a hero in Moonlighter, an action-RPG with rogue-lite elements where you’ll have to stay sharp to take care of business – not only with a sword but also quite literally, as you manage your own shop. Coming to Nintendo Switch this autumn. Children of Morta from 11bit studios and Dead Mage: Hack and slash your way through endless hordes of enemies in this narrative-driven roguelike, which can be played either single player or co-op. Experience what it means to be part of a family of heroes, as they fight to defend their legacy and each other. Children of Morta comes to Nintendo Switch in early 2019. This War of Mine from 11bit studios: In war, not everyone is a soldier. In this gripping survival game inspired by real-life events, you do not play as an elite soldier but as a group of civilians merely trying to survive in a city under siege. Test your decision making and emotional resilience to the limits when This War of Mine launches on Nintendo Switch in November. Streets of Rogue from tinyBuild: Streets of Rogue is the world’s only RPG/roguelike/ action/stealth/shooter/brawler megagame, and it’s rumbling on to Nintendo Switch this winter complete with 4-player co-op and exclusive enhancements. Choose from over 20 wildly different character types to fight, sneak and hack your way through randomly generated cities that make for almost unlimited replayability. Everspace: Stellar Edition from Rockfish Games: Shoot, craft and loot your way to victory in this fast-paced single-player space shooter, which combines roguelike gameplay elements with top-notch visuals and a captivating fully voice-acted story. Everspace: Stellar Edition contains the main game and the Encounters expansion, and blasts its way onto Nintendo Switch in December. Baba Is You from Hempuli: This unique and tricky puzzler lets you change the rules of the game as you go, leading to some surprising interactions. Experience the fresh and thought-provoking game design in Baba Is You when it comes to Nintendo Switch this autumn. Slay the Spire from Humble Bundle: If you wish to ascend to the top of the Spire, you must choose your cards wisely! This fusion of deck-building card game and roguelike RPG is already a hit on PC, and now it’s on its way to Nintendo Switch in early 2019. Night Call from Raw Fury: The clock is ticking and the meter is running! Night Call is a stylish investigative noire game set in Paris, in which you must balance the dual roles of sleuth and cabbie. Can you earn enough to pay your bills while also getting to the bottom of the murder mystery? Find out when Night Call launches for Nintendo Switch in early 2019. Terraria from 505 Games/Re-Logic: Dig, fight, explore and build! The world is at your fingertips in Terraria, an action-packed game that blends classic adventure with the freedom of sandbox-style creativity. Watch out for it on Nintendo Switch in 2019.